Privacy is perhaps the most hallowed of American rights—and most people are concerned that new technologies available to governments and corporations threaten to erode this most privileged of rights. 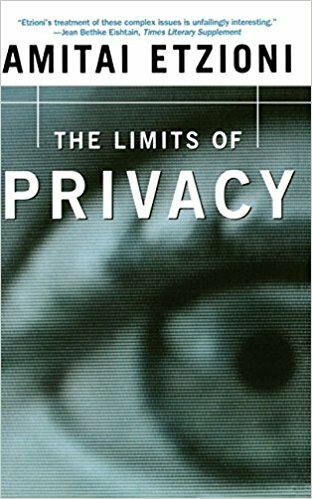 But in The Limits of Privacy, Amitai Etzioni offers a decidedly different point of view, in which the right to privacy is balanced against concern for public safety and health. Etzioni looks at five flashpoint issues: Megan's Laws, HIV testing of infants, deciphering of encrypted messages, national identification cards, and medical records, and concludes that there are times when Amricans' insistence on privacy is not in the best interests of society at large. He offers four clear and concise criteria which, when applied jointly, help us to determine when the right to privacy should be overridden for the greater public good.Almost every week headlines warn us that our cell phones are being monitored, our e-mails read, and our medical records traded on the open market. Public opinion polls show that Americans are dismayed about incursions against personal privacy. Congress and state legislatures are considering laws designed to address their concerns.Focusing on five flashpoint issues—Megan's Law, mandatory HIV testing of infants, encryption of electronic documents, national identification cards and biometric identifiers, and medical records—The Limits of Privacy argues counterintuitively that sometimes major public health and safety concerns should outweigh the individual's right to privacy. Presenting four concise criteria to determine when the right to privacy should be preserved and when it should be overridden in the interests of the wider community, Etzioni argues that, in some cases, we would do well to sacrifice the privacy of the individual in the name of the common good.